1. Heat the oil in a large saucepan over a medium heat. Add the leek, celery and carrot; cover and cook for 5 minutes. Stir in the spring greens, then add the stock and 250ml water; bring to the boil. Add the pasta and simmer for 6 minutes. 2. Add the peas to the pan and cook for another minute, then stir in the lemon juice and season. 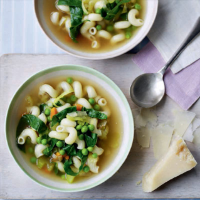 Divide the soup between 2 bowls and top with the shaved parmigiano reggiano.